If you have an issue with an aggressive dog at the park . . .
As a first step, try a polite and civil conversation with the owner of the dog you are concerned about. Sometimes a creative solution can be found. For instance, we had one situation that was resolved when the owner agreed to keep the dog muzzled while at the park. Or, if the problem is not severe, the owners could try a mutual agreement to keep on opposite sides of the park, or to visit the park at different times. After you have given a statement to the police, you can proceed to notify Donna Heller, Director of the L.M. Department of Parks & Recreation, at dheller@lowermerion.org , or (610) 645-6220. Parks & Rec will review the situation and, if circumstances warrant, may revoke the off leash permit of the offending dog. In all cases where there has been an injury to a person or dog, it is a good idea to document that with photos and/or a visit to the doctor or vet (as the case may be). If you are the owner of a dog that may have injured another dog or person at the park . . .
After the dogs are safely separated, best practice is to contact the other owner, ask whether owner and dog are ok, and where appropriate offer to pay for any damage caused. This can be very hard because both you and the other owner may be upset, but apologies or expressions of concern go a long way to ease tensions and promote a civil atmosphere at the park. Just because you have an incident does not mean your dog’s off leash permit can or should be revoked. Accidents happen. But remember . . . NOT ALL DOGS ARE SUITABLE FOR OFF LEASH DOG PARKS. A dog may be a fine dog and a beloved family member, but still not a good candidate for off leash privileges in a public park. To keep our dog park a friendly and welcoming place, concerns about habitually aggressive dogs must be addressed. Our policy is to rely on the police and township to referee disputes over dog aggression. Our organization is not trained or equipped to arbitrate disputes among dog park visitors. Our role in this area is strictly limited to providing educational information to help people resolve issues as amicably as possible through the proper channels. We cooperate with any inquiries about aggressive dog incidents from the police or the Lower Merion Department of Parks and Recreation. See also our companion brochure, “Etiquette: 10 Tips for a Great Dog Park Experience,” for some really good general guidelines on avoiding common dog park problems. Copies are usually available in the kiosk, and it is also available under the “Gettin’ Along” tab on our website. This entry was posted in Uncategorized on August 1, 2018 by Ellen Briggs. What projects do you think should be undertaken in the future? Our response: Our number one priority is trying to address the mud in a way that benefits both ecological and practical concerns. We have begun our campaign to reduce mud in an ecologically friendly way begun by planting bog-tolerant shrubs around the mud hole near the long boardwalk. If the shrubs grow and flourish, they should keep the dogs out of the water. We intend to keep on planting with the goal of providing food and cover to wildlife while keeping our dogs cleaner. Please note that we are moving ahead with this project in small increments rather than a mass planting effort all at once because these are difficult planting conditions and we expect to learn a lot by trial and error. We hope you will understand that our park is in a floodplain, and part of its important ecological function is to absorb and filter storm water before it reaches the creek. Also, the seasonal pools of standing water are necessary to the reproduction of park amphibians, which in turn help control insect populations. Therefore, diverting all storm water directly into Mill Creek so that the park is always dry underfoot is not one of our goals; rather, we will try to strike a happy medium between ecological and practical concerns. Our Response: Parks & Rec tells us that extending the wooden walkway around the park is not practicable because of the high groundwater levels. Containing the gravel by adding frames is not a viable solution either. Because of the high volume of water runoff that flows over the park, the gravel moves, either burying the frame and making it useless, or leaving the frame projecting out of the ground which creates a tripping hazard. Similarly, finishing off the rocky part of the path is not an option. Parks & Rec has tried to do this kind of project in the past. They have found that the fine finishing gravel (which works pretty well on the flat parts of the path) isn’t effective on the sloping paths. It gets carved into gullies and then ultimately washes away. Our response: Great idea! We are currently discussing this with Parks & Rec. Our response: We are very supportive of all reasonable measures to improve safety. We are currently looking at the possibility of some additional fencing and/or the planting of shrub hedges in areas of particular concern. However, it is important for everyone to understand that it not possible to enclose the park completely. Fencing cannot be installed either across the stream or in the area where the stream may flood while carrying debris. West Mill Creek Park is suitable only for those dogs whose owners can trust them off leash. A completely fenced area is available at Rolling Hill Park for dogs with less reliable recall skills. As far as a hole in the stone wall, we aren’t aware of one, though there was an opening between the fence and stone wall that has been dealt with by the independent efforts of one of our members. 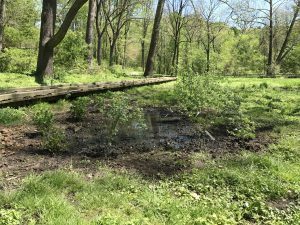 Our response: We spoke to the Department of Parks and Recreation and the Lower Merion Conservancy about this concern. 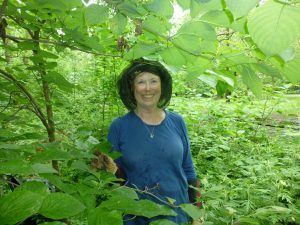 The Lower Merion Conservancy monitors water quality in our stream monthly for indications of ecological stream health such as levels of dissolved oxygen and number of macro invertebrates living in the stream. The state department of natural resources also monitors for stream health from time to time. 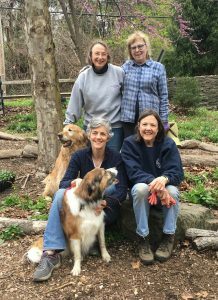 Tom Clark, Conservation Coordinator at the Lower Merion Conservancy, offered the opinion that the stream, while polluted from the point of view of ecological stream health, is not necessarily detrimental to dog health. He also noted that if we observe a “fish kill” (numerous fish floating on the surface) that is an indication of toxicity that definitely would be of concern for canine health. Finally, he noted that pollution levels are highest during and just after storms with lots of runoff entering the creek. Mill Creek water is not safe for human consumption. 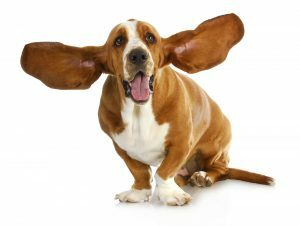 No one we talked to is aware of any particular test for toxicity to dogs, but many of our canine dog park regulars have been drinking the water for their entire lifetimes with no apparent ill effects. If you are concerned, we suggest discussing this issue with your veterinarian. Our response: You are so right! Dog poop is a major source of stream pollution and threatens the health of people and animals that use the stream. We hope all West Mill Creekers will take a look at our “Poop FAQs” sheet that is available on our website under the “Gettin’ Along” tab and in brochure form in the park kiosk. It answers a lot of the questions people have asked us in the past on this issue so please take a look! Our response: Irises would be lovely! We are discussing feasibility with the member who suggested this. Any other comments or thoughts you would like us to consider? Our response: Positive feedback is extremely encouraging and energizing to all on the Steering Committee. 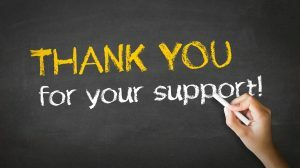 We thank all those volunteers and contributors who have helped make this happen and we also thank our survey respondents for the supportive comments on our efforts—we really appreciate it! 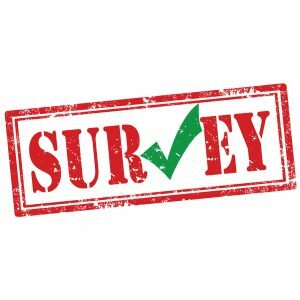 THANKS TO ALL WHO PARTICIPATED FOR RESPONDING TO OUR 2017 SURVEY! This entry was posted in Uncategorized, What's New on June 26, 2017 by Ellen Briggs. WMC volunteers began work on our plan to plant bog-loving shrubs in or around low-lying areas in the main park. If the new plants thrive we will reduce our muddy-dog quotient while improving the park ecology. Our first set of shrubs (pussywillow, itea virginica, and summersweet) is planted around the notable mud hole near the long boardwalk. Please wish our new shrubs health and long life, and do try to steer your dogs away from them while they are getting established if you can! 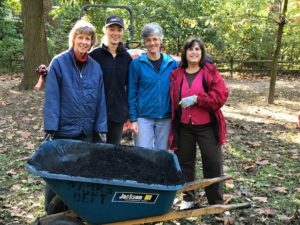 In addition, our April 15 Wildlife and Respite Garden work day resulted in major gains in our battle against the weeds — also a lot of fun. Later we planted a large number of Black Eyed Susans to brighten up the Wildlife Garden in midsummer. This entry was posted in Uncategorized on May 1, 2017 by Ellen Briggs. 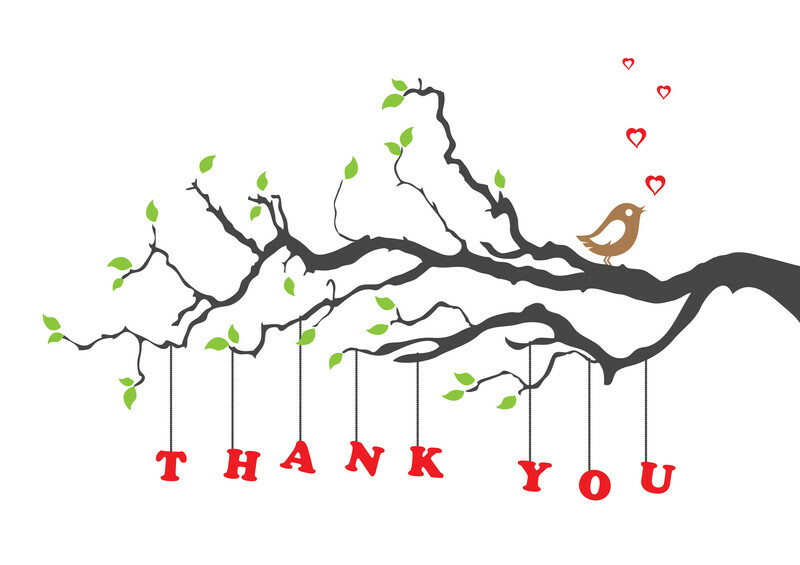 THANK YOU FOR YOUR GENEROUS DONATIONS TO FRIENDS OF WEST MILL CREEK PARK! This entry was posted in Contributing Members, Uncategorized on April 6, 2017 by Ellen Briggs. Knotweed is a noxious invasive plant that vigorously self-plants itself in moist areas, degrades the ecosystem, and ultimately promotes soil erosion on stream banks. At this annual event, we cut the plants to the ground and dispose of the stems, giving the “good guy” plants a better chance to take over the territory. Wear long pants and long sleeves, and bring gloves! Come and go as you please. Water and Kind bars will be available. This entry was posted in Uncategorized on April 1, 2017 by Ellen Briggs. Santa Paws once again took time from his busy schedule to visit all the good dogs at West Mill Creek on Sunday, December 18! 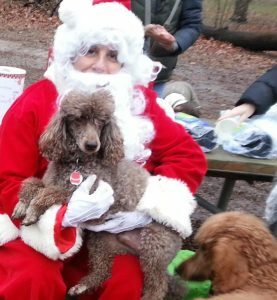 It may have been a little overcast and a lot muddy, but the dogs enjoyed the dog biscuit and the chance to give Santa their wish lists, and the people enjoyed some hot cocoa and doughnuts to keep out the damp. Moreover, we raised $435 for the Pennsylvania S.P.C.A! Thanks to all who participated–including Giant supermarket which generously donated the doughnuts. This entry was posted in Uncategorized, What's New on December 19, 2016 by Ellen Briggs.